Last week the Federal Reserve released transcripts of emergency meetings that they held during the peak of the 2008 financial crisis. Releases such as these are required by federal law, but by now the information is woefully out of date, so it’s unfortunately far too late for you to do anything meaningful with it. Still, even these out-of-date releases make for fascinating reading, because they show the other side of the Fed’s duck-like behavior, as they paddle like mad underneath the surface. Now we know exactly what was up with that. The transcripts show the frantic bumbling behind the scenes; how the Fed actually CHOSE to let Lehman fail, as an example to others, and how they failed to grasp what was really going on and why it was happening. We see how, behind closed doors, they were everything that they swore in public they were not: confused, panicked, argumentative and tremendously uncertain. Yet they boldly and confidently proceeded to print dollars like they were going out of style (which they now very well may be) and shovel them out to all the banks who got themselves into trouble. From that shaky foundation came several rounds of Quantitative Easing that we’re still dealing with, as well as a banking system that is now based on institutionalized failure. What this has done (and is doing) to the dollar is still unfolding. We DO know that inflation measures and other economic statistics are wildly manipulated to hide the real damage. We also have strong evidence the price of gold has been monkeyed with to make the dollar look better. What is the Fed doing to the economy? Is our central bank doing more harm than good? And what can we do about it? When it comes to the financial system as a whole, maybe not a lot. But when it comes to the soundness of our personal finances, we can take steps to prepare. What might help us prepare our affairs? If the Fed actually offered more complete and timely information about what they were doing. 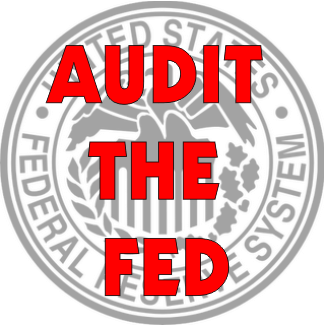 Most people don’t understand how secretive the Fed is allowed to be about its most important functions – the ones that affect you the most via the purchasing power of the dollar. “Allow the people to have a more fully-informed debate.” Isn’t this one of America’s core founding principles? And yet this bill is facing so much resistance??!? The fact that such common sense legislation has been fought against so hard and stalled for so long makes you wonder what they are hiding. The recently-released transcripts from 2008 give us a clue: tragic incompetence and cronyism.